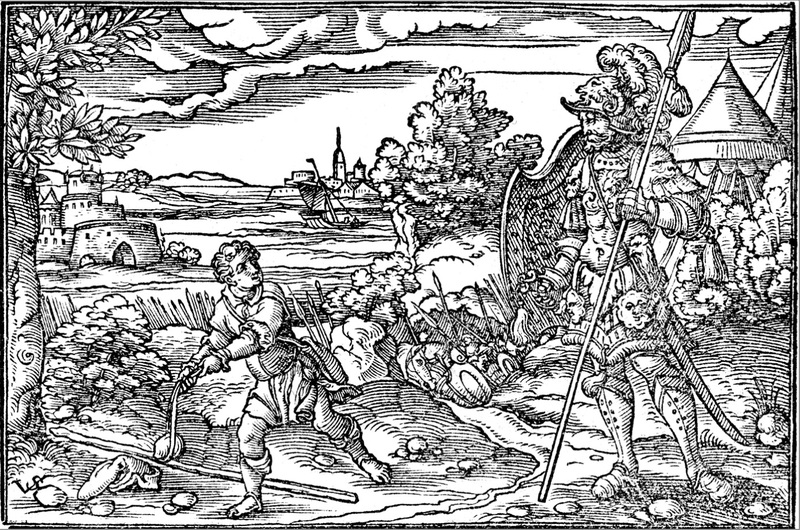 Many of our words for ignorant barbarians derive from previous generations of prejudice. In particular there are two categories of prejudice that have given us quite a handful of excellent words with which to insult the uncultured, ignorant slobs in our lives. 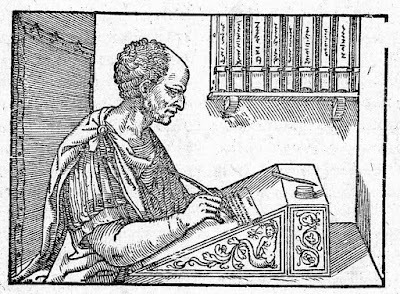 First, classical Rome’s xenophobic condescension for all people who weren’t Roman (or Greek). vandal - a person who willfully or ignorantly destroys or mars public or private property. This is a Latinized form of the name of the tribe that sacked Rome in 455. There is no evidence that they were particularly willful or wanton in their destruction, but you can certainly understand why the Romans would have had a prejudice against them. 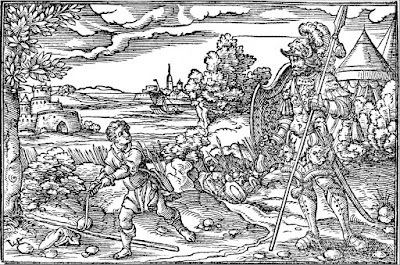 barbarian - from Latin for “foreign country”, from Greek meaning “foreign, strange, ignorant,” this word comes from a Proto-Indo-European root echoic of unintelligible speech of foreigners, cognate with babble. Foreigners, in other words, are the people who say “blab blab blab,” and who, in the Greek and Roman opinion, are ignorant, uncultured, and savage. The next group of insults betray class prejudice. There are an awful lot of words for non-noble people who no doubt began poor but honest, but ended up becoming stupid louts. boor - originally “herdsman” or “farmer,” in English the word was first applied to agricultural laborers from other lands, as opposed to our good English stock, so this word involves the intersection of both classism and xenophobia. And finally, here are a few other words whose negative meanings betray the prejudices of society. hooligan - appearing in usage in 1898 as a comic stereotypical Irish character (probably a variant of the Irish surname Houlihan), it tells us exactly the sort of stereotypes the Irish were given in the late nineteenth century. cretin - this word derives from a Swiss French dialect word for “Christian,” but it isn’t prejudice against Christians that gives it its derogatory meaning “stupid, obtuse, or boorish person.” In fact, the term was meant to be kind, a reminder that those suffering from impairment of physical and mental growth due to congenital hypothyroidism are people, too. However, like many other words for people with intellectual disabilities, (such as moron, idiot, retard) it eventually lost its clinical or technical sense in favor of simple insult. As we’ve seen before (for example, here, here, and here), every time we open our mouths we reveal our attitudes in the words we choose and the ways we use them. And language retains the attitudes of past generations - sometimes for hundreds of years! I don’t advocate getting offended by lingering linguistic traces of the bad attitudes of previous generations of speakers, but it’s always worth it to be aware of where we’ve come from and what baggage might have stuck along the journey. I’m currently working on a sequel to The Extraordinary Book of Doors, which is provisionally called The Extraordinary Salamander Door. 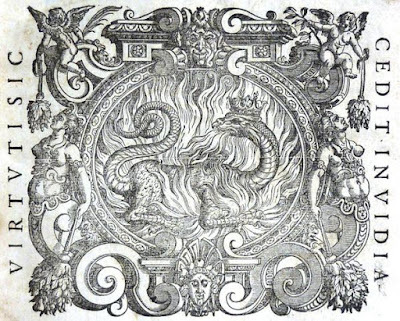 The title refers to the mythical beast, not the actual amphibian of the order Urodela, and represents both the symbol of Francis I of France (who splashed his symbol all over the place in real life and commissioned the magical Books of Doors in my fictional world), and also a sanctuary of mythical creatures. 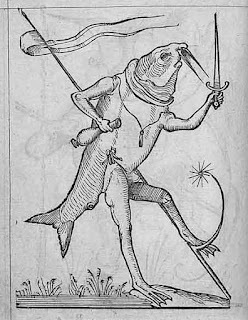 So today seems a good day to share some of the lore of the legendary salamander. The mythical salamander looks much like the real one, though usually rather more reptilian than amphibian. 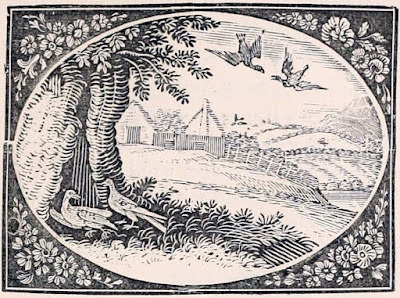 (In fact, sometimes all manner of creatures, from avian to semi-human, apparently got called salamanders on occasion, but let’s rein in the more far-fetched nonsense.) 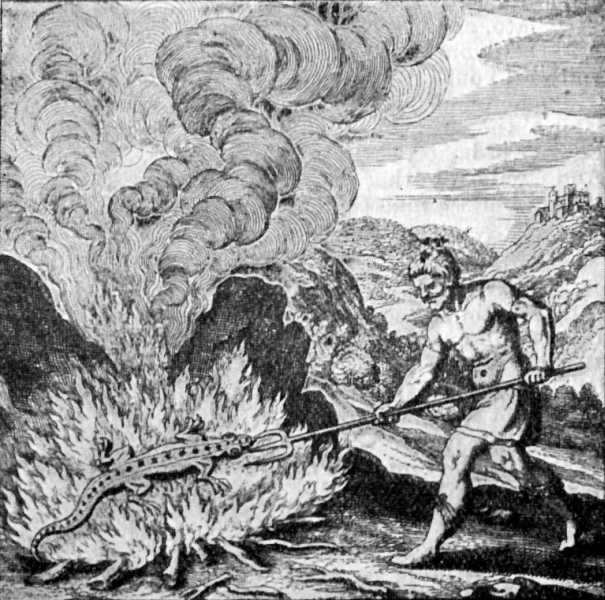 The chief difference between pictures of real and mythical salamanders, though, is that the mythical beast has a special affinity for fire and is always shown in the midst of flames. Some species of real salamanders excrete toxins from their skin when threatened; legendary salamanders are so poisonous that simply by climbing a tree one can poison all its fruit. But the fire traits are the most important. 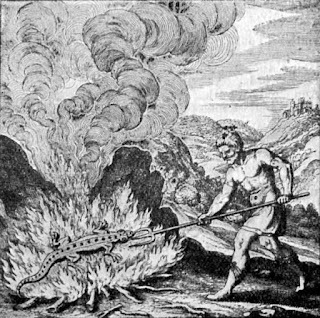 A salamander is so cold that it can put out fires. 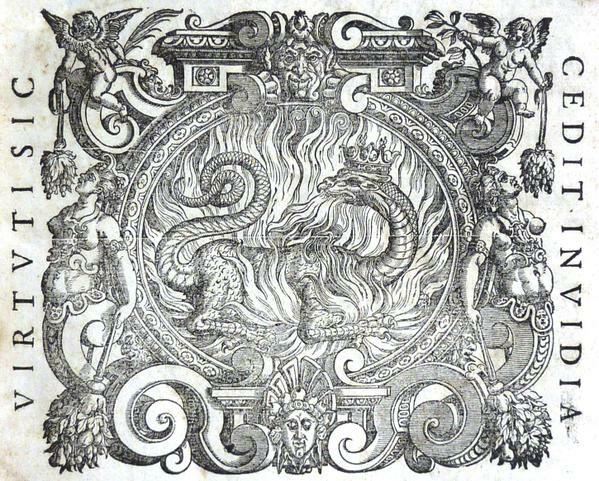 It is produced by fire, especially fires that burn in the same place for seven years. It needs no food but the fire, which renews it. 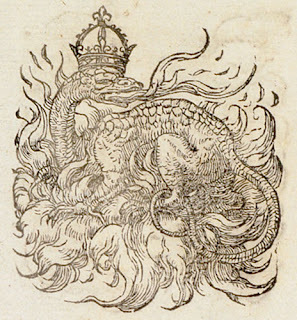 If you smear yourself with salamander blood, you, too, will be fire-proof. You can also make yourself fireproof clothing from salamander wool, which is a little harder to figure out. Have you ever actually looked at a salamander? murdered by superstitious people. But in the unlikely event that you need to kill the mythical salamander, the only way to do so is to lock it up in an enclosed space where it will have to breathe its own poison. But please don’t. Mythical creatures are endangered enough as it is, and we need to preserve their habitat of fantasy so that we don’t lose them forever! I’m trying to do my part with The Extraordinary Salamander Door. What are you doing? 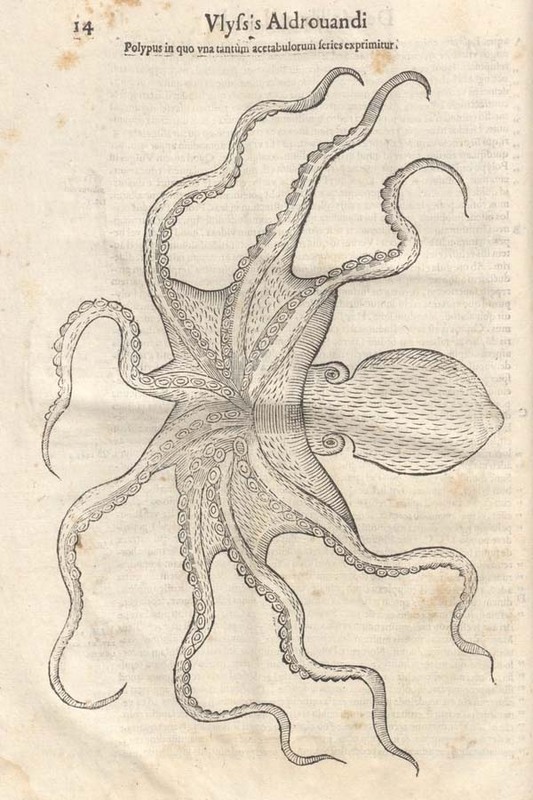 We are in the midst of Cephalopod Week, and that’s not something I could possibly ignore. 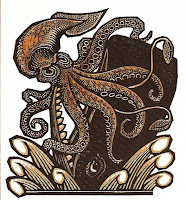 I love octopuses - and squid, nautiluses, and cuttlefish aren’t bad, either. What you really should do to celebrate is find some videos of cuttlefish color changes, octopus problem-solving, fantastically weird and sometimes adorable recently discovered species, or some other cephalopodish fabulousness. However, it isn’t my job to show you such videos because that’s not supposed to be what this blog is about. 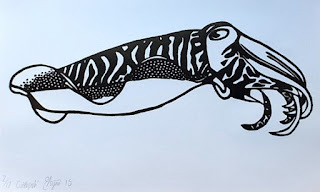 No, this is a blog about block prints, and that’s how we’re going to observe Cephalopod Week. 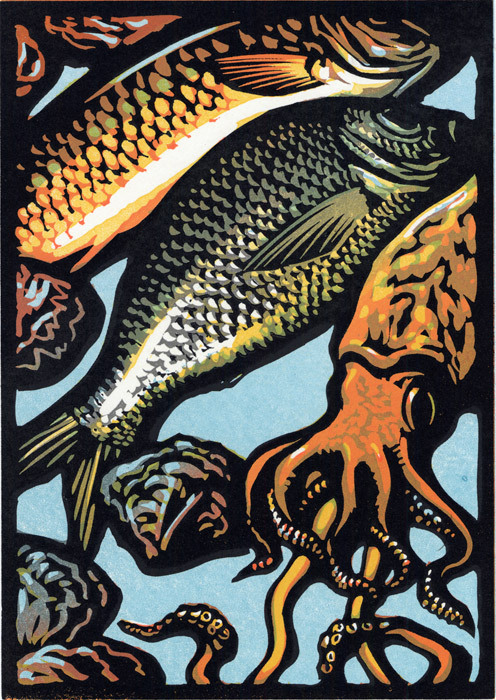 I’ve shared my own block prints of cephalopods (octopus and nautilus) before, so for today I will share some others I’ve discovered. 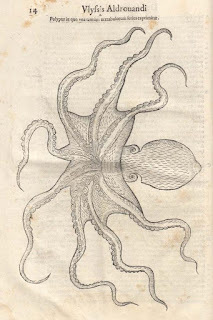 We’ll begin with a classic, some sort of octopus from Aldrovandi’s De reliquis animalibus of 1606. I like the curliness of its eyes. 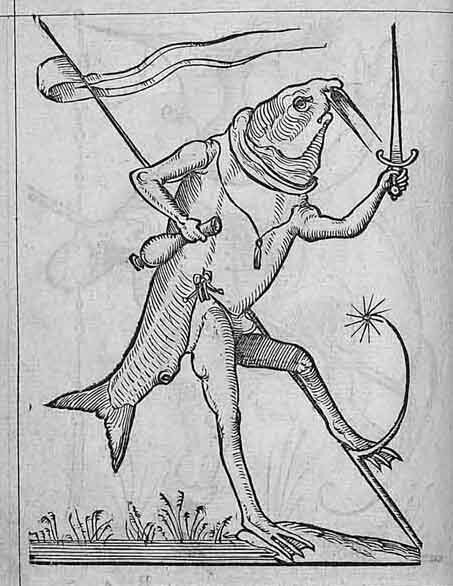 This is a reasonably accurate depiction for an early natural history book, with nice detail for the suckers. This unfortunate but handsome squid is laid out on the fish counter, which obviously isn’t where it would like to be, but it does give me the opportunity to point out that fried calamari ranks among the other excellent qualities of the cephalopod family. This giant squid looks very angry and fierce as it fights a sperm whale. I like its pattern of speckles and circles, and the jaunty angle of its mantle. This one is reminiscent of the long tradition of depicting cephalopods as monsters, despite their generally shy and retiring nature. 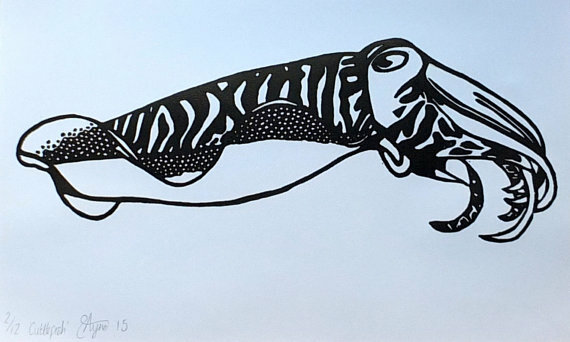 And here’s a cuttlefish, because they tend not to get as much love as the octopuses and squids. It captures nicely both the beautiful watery pattern of its skin and the beautiful wavy undulations of its swimming. Yay cephalopods! Now head on over to Science Friday to continue the party. 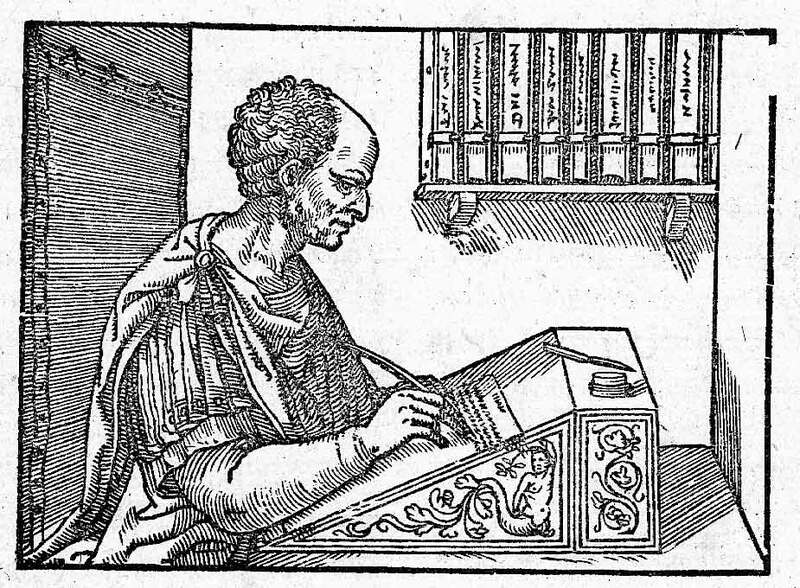 He was really more attached to truth than the poets [historians] are; for the latter do violence to their own stories in order to make them probable; but he by announcing a story which everyone knows not to be true, told the truth by the very fact that he did not claim to be relating real events. from the essay On Fairy-Stories by Tolkien, 1939. Tomorrow is M.C. 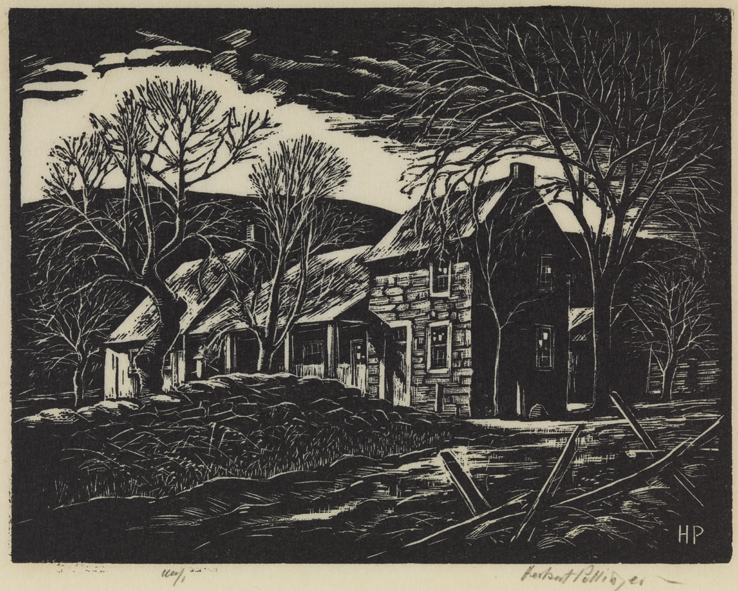 Escher’s birthday (he was born in 1898), so I thought I’d share a few more Escher wood block prints that I love. These come from a series of prints of the city of Delft, made in 1939. 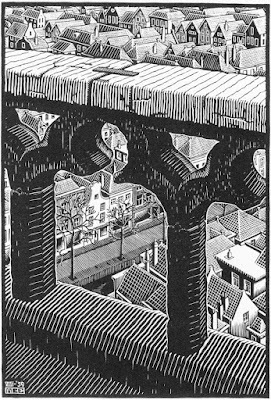 They don’t include any of the mathematical tricks or optical illusions for which Escher is so famous, but even so you can see that he delights in interesting angles and points of view. 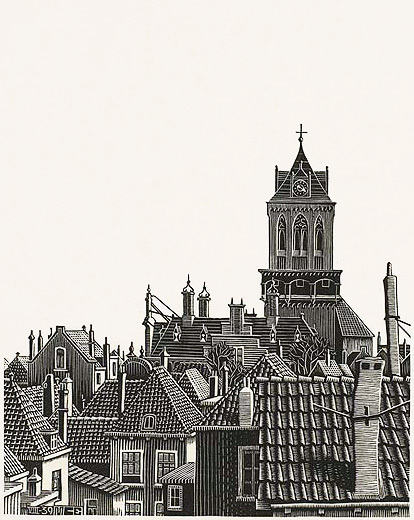 Moreover, he clearly picks up on what geometric elements there are in tiled roofs and blocks of buildings. 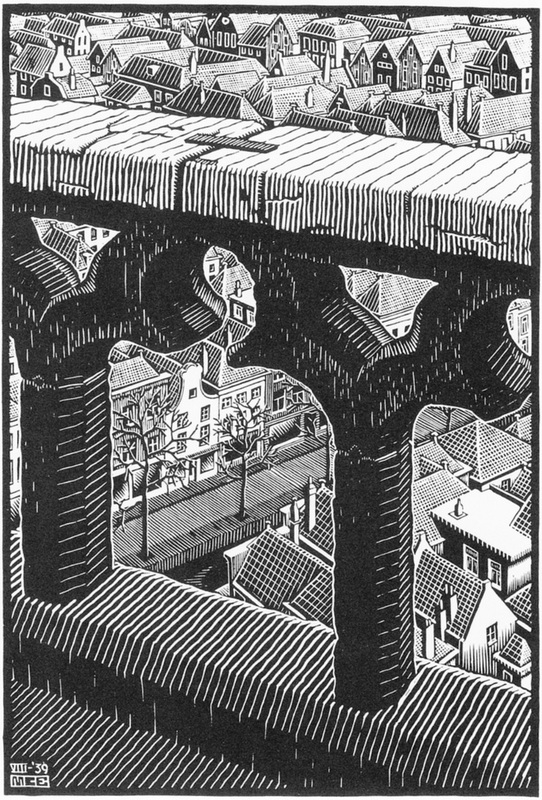 I find it interesting that for each of these three pieces Escher has chosen a different way to arrange and fill the space, from the plain white sky that fills half the paper, which is quite uncharacteristic for Escher, to the tiny distant buildings filling every centimeter of background almost like a tessellation. 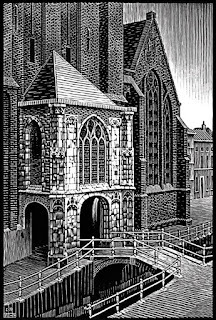 I shared four more of Escher’s views of Delft from the same year on the occasion of Escher’s birthday two years ago. You can see them here. 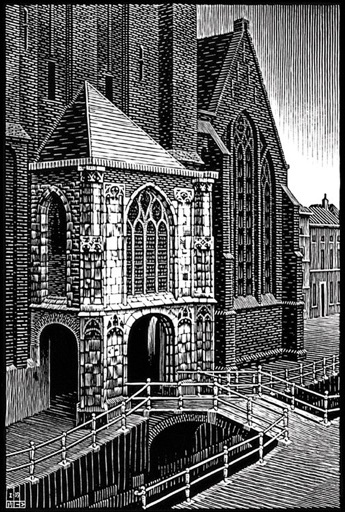 Delft is such a scenic city that it would be hard to go wrong portraying it, but even so you can see that Escher has come up with interesting ways to show something a little different from stereotypical postcard scenes. 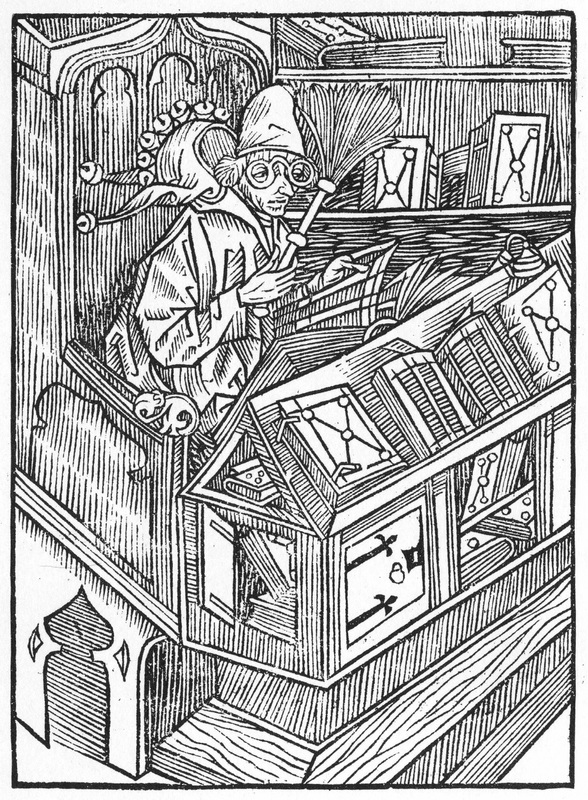 You can never have too much Escher, so I hope you enjoy his birthday gift to all of us! 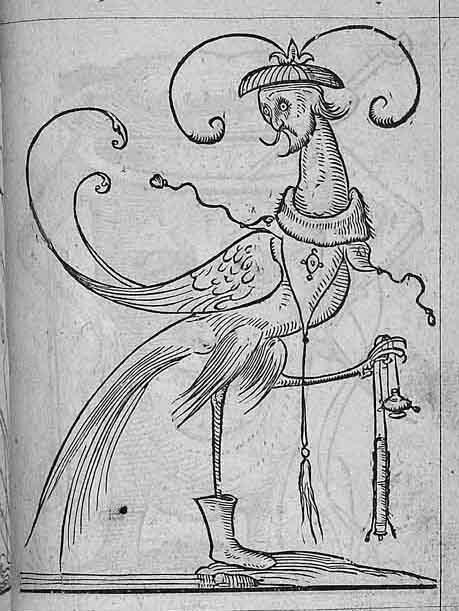 Les Songes drolatiques de Pantagruel (The Comical Dreams of Pantagruel) is a series of woodcuts of grotesques published in 1565 by Richard Breton and François Desprez. As far as I can tell, this has no plot or story to it, but consists only of the pictures without explanation. 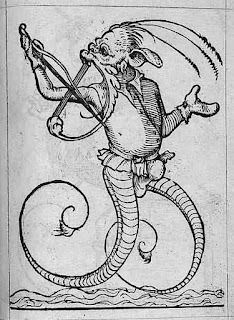 It also has little to do with Rabelais’s Gargantua and Pantaguel, except, I suppose, in being an attempt to ride the coattails of that giant duo. What it does most assuredly have in common with the work of Rabelais, however, is that it’s clearly intended satirically, and its humor is crude, often scatalogical, employing much absurdity and topsy-turvidom. 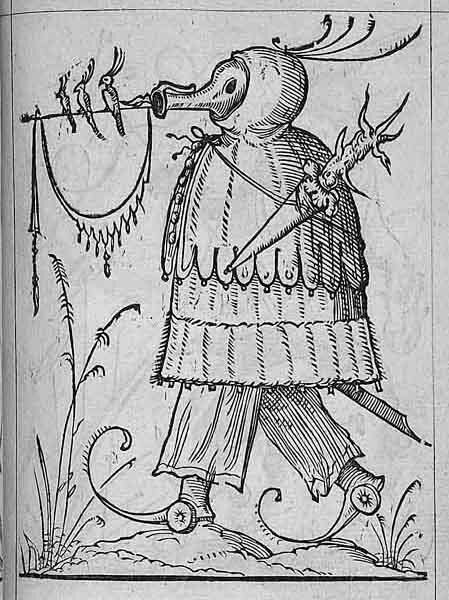 The figures include deformed humanoids, and also hybrids of humans, animals, and objects such as weapons, cooking utensils, musical instruments, and more. 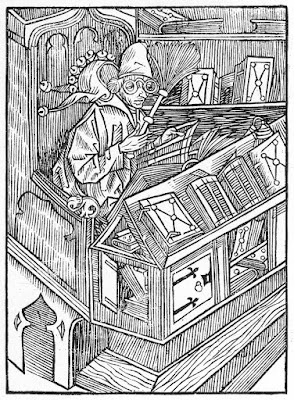 They definitely share the vibe of Heironymus Bosch, whose paintings were roughly 50 years previous. enticed by all the comparisons to The Phantom Tollbooth, was sorely disappointed.) 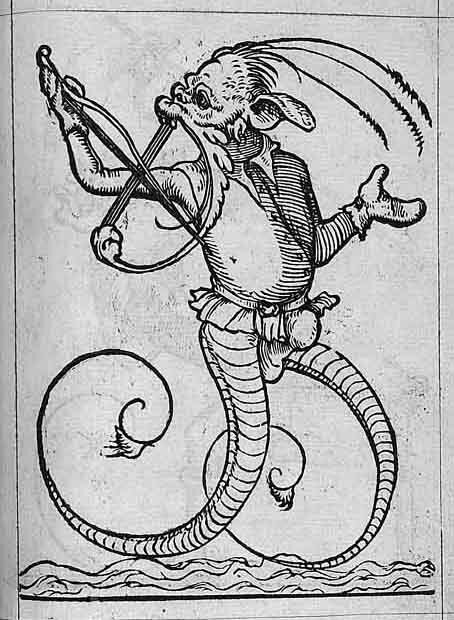 I’m not sure these grotesques of les songes de Pantagruel are intended to make any particular point, or just be generally sly and disrespectful in tone. Four hundred and fifty years after their creation I have no idea what half the objects in the images are meant to be, let alone what they might have symbolized to original viewers. expression, but who cares! He’s playing his face! I thought these guys were delightfully weird, and they manage to span tastes all the way from Mad Magazine to High Art. 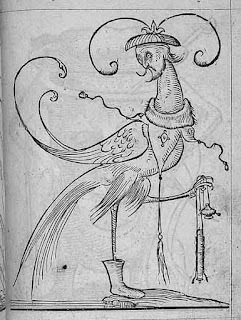 That’s just part of the genius of the Renaissance, I guess: not only did scholars aspire to all knowledge, but artists aspired to all levels of taste and humor. 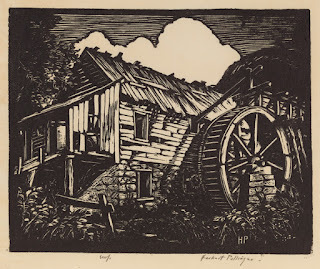 The block I began carving at my show this past weekend is an old grist mill, so when I saw Herbert Pullinger’s wood engraving of a mill this morning, I thought it was clearly the right time to feature his work. Actually, he’s got a number of prints of mills, and a few other industrial scenes, plus plenty of other landscapes with more nature, domestic architecture, or small town streets. I like his work a lot. In fact, I loved so many of his pieces that I’ve had a terrible time selecting just a few for this post. Such a horrible problem to have so many beautiful things to share! 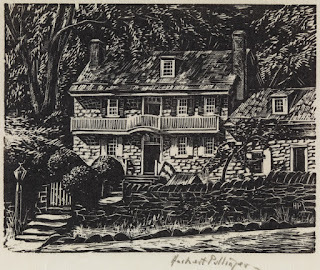 Pullinger (U.S. 1878-1961) is one of those many artists obscure enough that I can’t find much information about him, yet he’s clearly unworthy of obscurity. 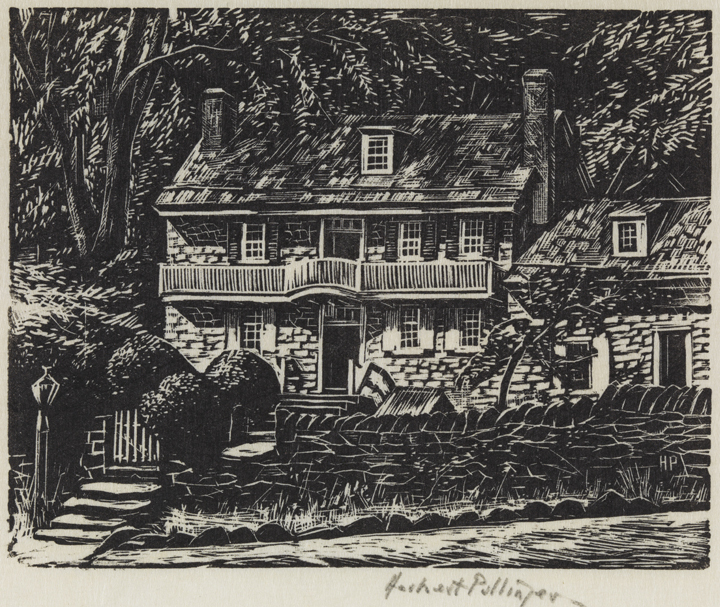 Like many artists during the 20s and 30s, Pullinger tried to show everyday scenes in cities and towns. 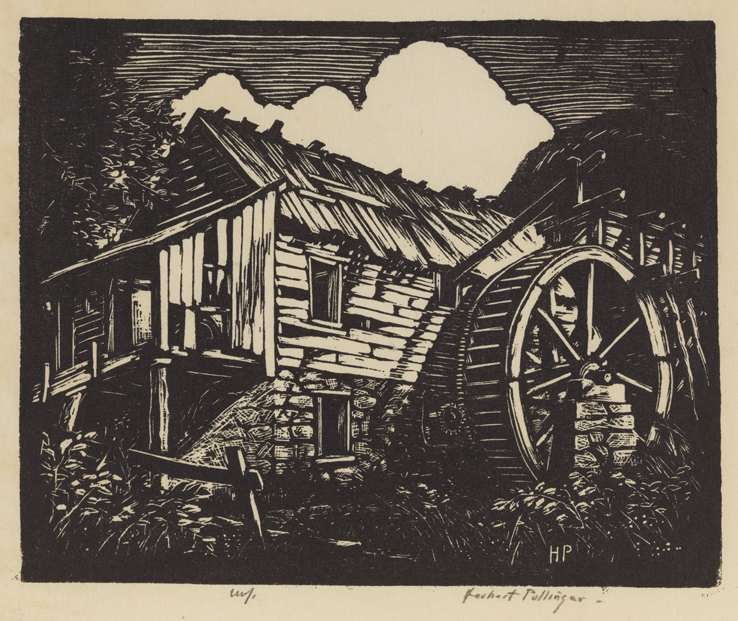 He depicted industry and agriculture, ordinary people out strolling or driving their carts… He had quite a long career as a printmaker, but his general style and vibe seems to have stayed pretty stable across the decades. 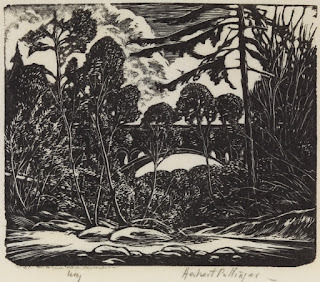 His wood engravings have a lovely balance of black and white, and I love that, despite the fineness of the detail, Pullinger’s work never looks like anything but carved wood. Depression. 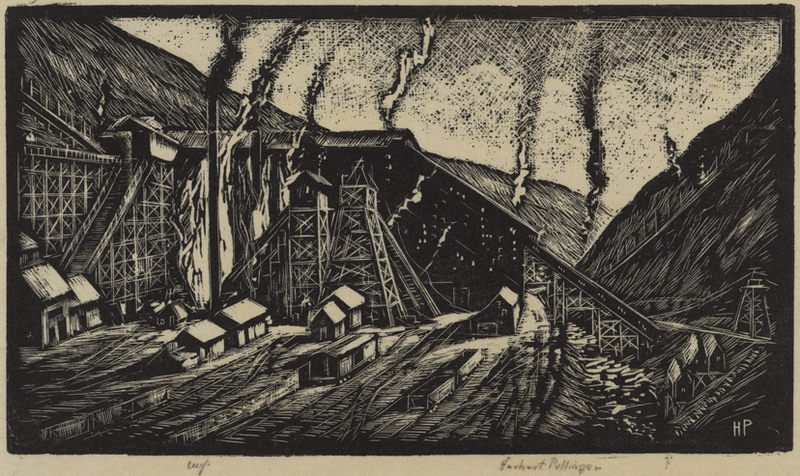 The magic of wood block prints, of course, is that they have the power to reveal the beauty even in scenes that are potentially eyesores in real life. This is especially true in the other industrial scenes I’ve included, Breaker and steel furnaces. 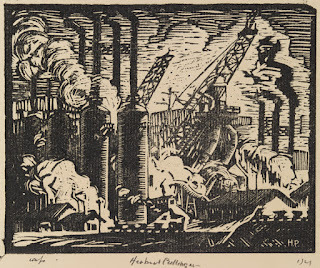 Admittedly in the first half of the 20th century many people viewed such industrial scenes as symbols of progress, but oh, those clouds of pollution! 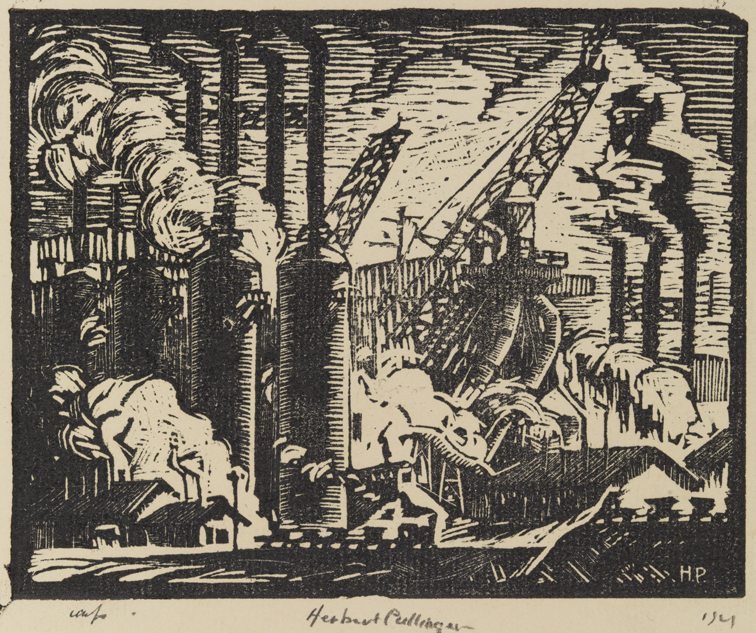 Those smokestacks endlessly spewing, the torn up earth, the rivers choked away in the sprawl of sheds and foundries and furnaces! 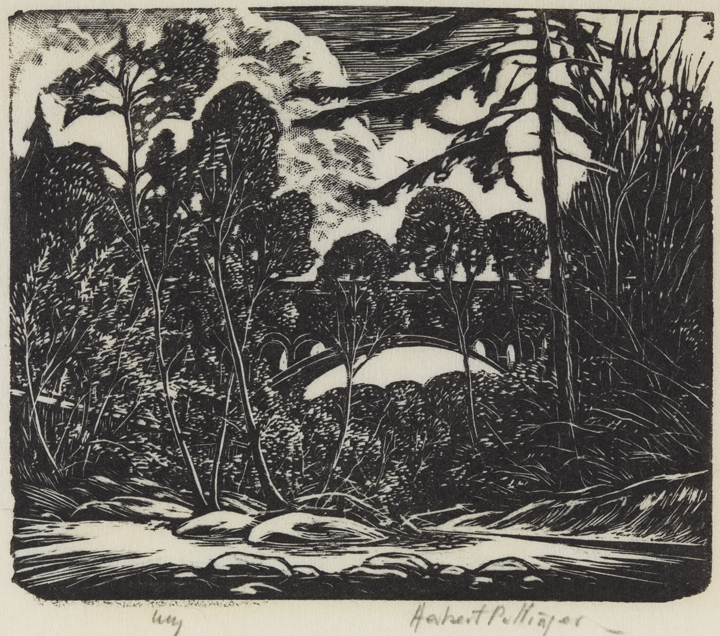 And yet, isn’t it all beautiful in Pullinger’s scenes? Straight lines against curves, tiny details against great bold strokes, black against white! 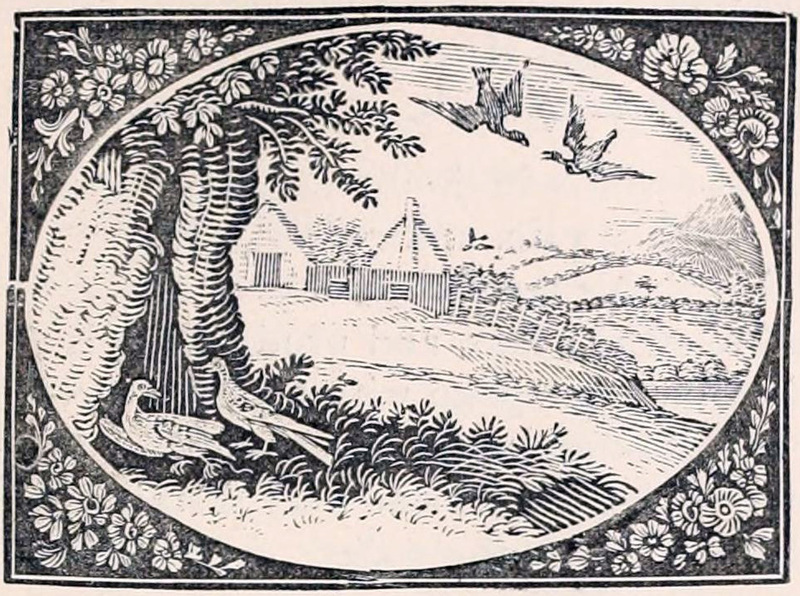 As a little respite from that energy, why not admire a scene with much more nature: a peaceful bridge over a tree-lined river. I wish I could figure out how to depict trees like this: just enough pattern to suggest all the varieties of texture, but never overworked. 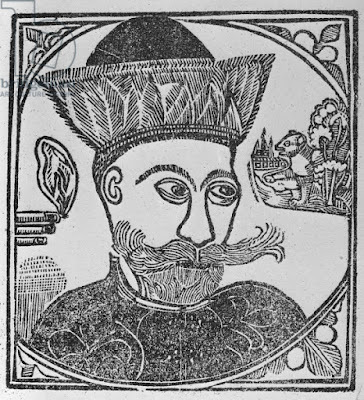 I’m quite smitten with Pullinger’s work, and pleased to be able to share my new discovery with you! Last year I saw some smug science-trivia thing stating all condescendingly that the moon doesn’t really look bigger at the horizon, which you can prove by holding out a quarter at arm’s length and comparing it to the disc of the moon when it’s at the horizon, and again when it’s higher in the sky. I was quite astonished by the stupidity of this statement. After all, if you’re telling me the moon isn’t really physically larger when it’s at the horizon, well, yes, I knew that. No one was ever suggesting that the real moon actually grows and shrinks through the evening. And if you’re telling me the moon doesn’t look bigger, I can only reply with perfect confidence, yes it does. And if it doesn’t to you, it certainly does to me. I know my perception, and for you to try to tell me I don’t feel what I feel is just stupid (as well as arrogant.) And so with the people who love to say “There’s no such thing as Writer’s Block.” Of course there’s something. Sometimes people feel stuck, and to tell them they don’t really feel stuck is stupid and arrogant. Likewise, to say that you should “just get over it” is about as helpful as telling someone to “just stop worrying,” probably the most futile words ever spoken. That said, having writer’s block doesn’t mean you get to blame your writing problems on outside forces beyond your control, so that you can sit passively back and do nothing about it. The first job is to examine this phrase “writer’s block” and see what the phenomenon is all about, because the problem isn’t writer’s block as much as it’s writer’s blocks. This post is not about 7 Tips to Cure Writer’s Block. I don’t have any new wisdom to add to the extensive self-help literature already out on the subject. Nevertheless, breaking down writer’s block into writer’s blocks may also be quite helpful in getting unstuck. So the first way to break it down is the difference between facing resistance and being empty. If you can’t seem to get going on any ideas, is your feeling one of having to fight resistance, or do you feel like there are simply no ideas there to work toward? If the former, you need to show up to work and do what you can: writers write. But if the latter, you need to get away from the desk and refill, recharge, refresh: an engine can’t run without fuel. Some people categorize writer’s blocks by the psychological issues causing them. Is it fear of rejection or criticism that’s holding you back? Perfectionism? Stress or depression in other parts of your life? Are you distracted by email, ringing telephones, children, or other things going on? There’s a psychological theory that under various sorts of stress, the brain shifts control away from the cerebral cortex, thus making creativity, which is dependent on the cerebral cortex, harder (if not impossible.) The psychological issues of fear, stress, and lack of focus are those that call forth the armies of positive thinking and self-affirmation. I certainly can’t help you with that! The phenomena of writer’s blocks can also be usefully broken down by the type of problem you’re facing in your particular piece of writing. Are you staring at a blank page unable even to begin? Have you stalled out in the middle of a story? Is it the characters or the action that seem to be stuck, or is it that the two won’t work together? Has your story veered off course, or have you changed your mind about where it should be headed, and you can’t seem to wrench it back onto the tracks? Are you trying to write about something that simply doesn’t interest you? Maybe you just can’t figure out what should happen next? I can’t tell anyone how to fix their writer’s block (heck, I can’t even fix my own), and I can only say that, surely as the moon looks huge at the horizon, writer’s block can loom over the landscape. But unlike a big, luminous moon, writer’s block brings no delight to the soul. In fact, it utterly stinks. It feels frustrating, aching, infuriating, futile, desolate… There are a number of things to try that may be helpful, ranging from getting out and away to take a walk, to chaining yourself to the desk and free-writing whatever drivel you can manage. You can brainstorm, you can skip to another part of your piece, you can write a scene from a different character’s perspective, you can imagine what your characters would write in their own essays on the topic of “What I Really Want to Do.” You can also try acupuncture, self-hypnosis, chocolate, exercise, or whatever else works for you. Go ahead and acknowledge that you’ve got Writer’s Block. But don’t stop there and passively wait for the muses to show up with their magical dynamite and blow the block away. Try to figure out which sort of block you have, and then do something about it! Actually, I’m glad the rain came, since we needed it, but I’ll admit the chill is not so welcome. 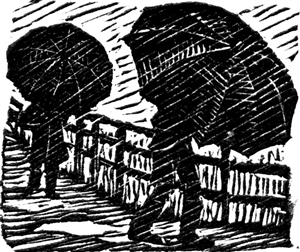 Nevertheless, without further ado, let’s get right to work celebrating the rain with block prints. First, a very graphic piece by Chris Bourke. 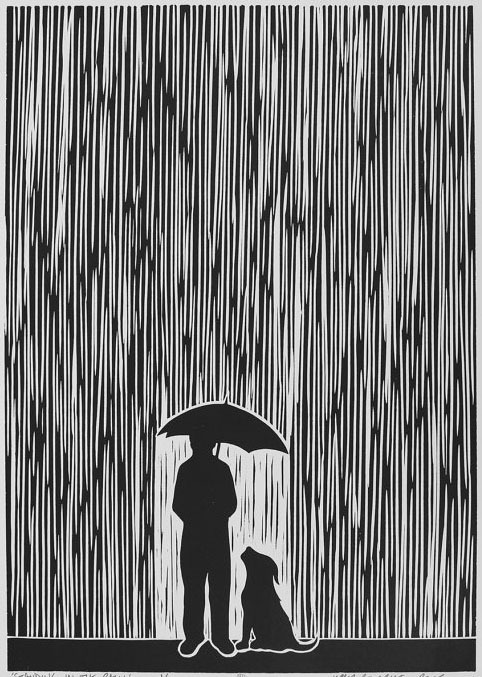 I’m not sure whether the lesser rain below the umbrella represents the rain behind the man, or whether it’s rain coming through. 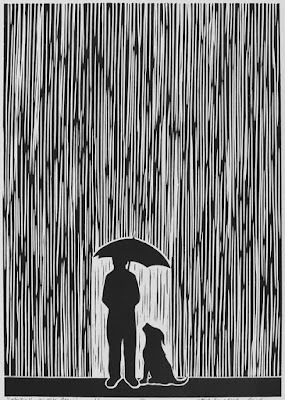 Certainly even when your umbrella is perfectly good, you still end up feeling awfully wet after a walk through that kind of downpour - especially with an affectionate dog by your side. I like the lack of detail in the figures, which makes them seem even more isolated, and I like that they don't look beaten down by the rain. I also like the height of the rain above them, reminding me that rain goes all the way up to the sky. Second, more people out with their umbrellas, something I confess I haven’t done. I probably should get out for a walk, but instead I’m huddled up inside with my scarf and my mug of tea. These people are fighting wind as well as rain, and although there are two of them, they don’t seem to be together and indeed they’re probably so encapsulated by their umbrellas and their hunching hurry that they’re pretty oblivious of each other. This last one is the most how I feel right now! Just waiting it out. 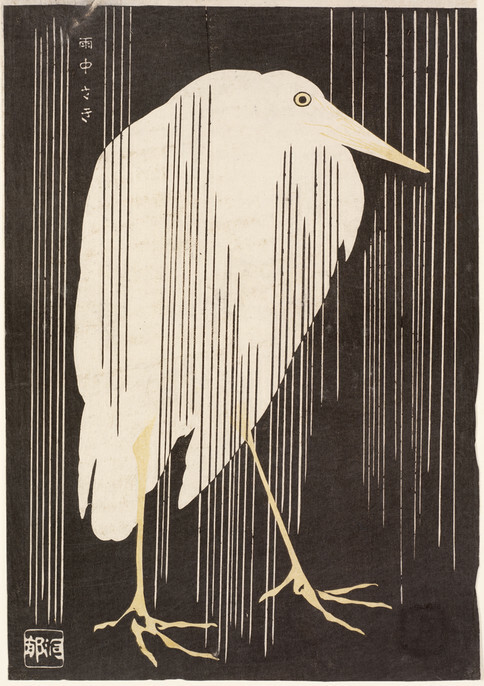 In tracking down this excellent heron, I discovered a number of extremely similar storks or waders attributed to a few different artists. Presumably this was a classic traditional theme, but I don’t know whether Kawanabe Kyosai was the first to come up with it. 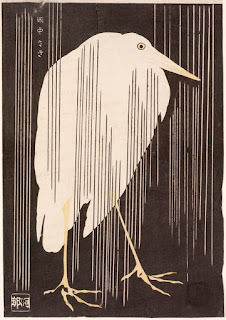 In any case, I like this print’s simplicity and the bird’s stoic look. All through May we had July, so I shouldn’t complain that so far our June is more like April. I’ll just go reheat the mug and get a blanket until summer comes back.